In the spirit of trying to get caught up with scrapping our family's travels, I tackled an especially difficult-to-scrap topic: Steve and Trevor's adventures during my 2016 visit to Anaheim for the CHA Mega Show (now the AFCI Creativation Show). While I spent five days at the show, the two of them went to a hands-on science museum, took a train to San Juan Capistrano and toured the mission, spent a day at Legoland in Carlsbad, went to Medieval Times, and visited the coast for hiking, geocaching, and tidepooling. Not only did they have a ton of photos (on three different cameras), but I wasn't with them for any of it. So I had to rely not on my memory, but on the daily journal entries I did while at CHA about how they'd spent their time. Challenging! I'm happy with how the page came together. 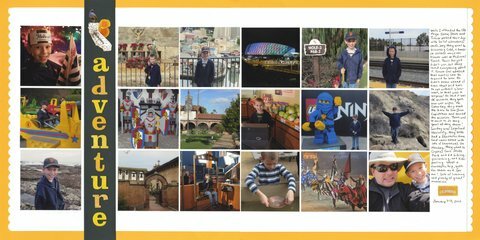 I chose 18 of my favorite photos that represented all the activities they did and made a grid. I would have liked for Steve to be in more than one photo, but at least he's in the selfie in the lower right. I added a title and journaling, then tucked in a scalloped border. Finally, I embellished with stickers given to me by my fabulous (and generous!) friend Julie. Another gap in the 2016 album filled - yea! You did awesome!!! That's how I always feel when I scrapbook an album for someone else - it's hard to do when you didn't live it! LOL!!! I loveeeeeeee this! LOVING the photos and the title work!!!! !